"We are tracking the Viktor Leonov's presence off the East Coast, much like we are aware of all vessels approaching the United States," said Navy Cmdr. Bill Speaks, a Navy spokesman. "We respect the right and freedoms of all nations to operate in international waters in accordance with international law," he added. A military official said the Leonov, a ship known for conducting annual forays near sensitive U.S. military facilities off the East Coast, is currently operating off the Georgia coast near Naval Submarine Base Kings Bay, home to U.S. nuclear missile submarines. The ship for the past several days was located some 20 nautical miles offshore and has been closely shadowed by U.S. military ships and aircraft, including P-8 surveillance aircraft. The spy operations come days after Russian President Vladimir Putin announced Moscow's development of new and "invincible" nuclear weapons aimed at the United States. A video presentation during the Russian leader's speech showed a simulated multiple-warhead nuclear strike on Florida. Putin, in a speech in Moscow, also touted a new unmanned underwater vehicle capable of delivering a megaton-sized nuclear warhead against ports and coastal cities. Kings Bay is the location of Submarine Group 10 that includes six nuclear-armed ballistic missile submarines and two guided missile submarines. It is also the location of Strategic Weapons Facility, Atlantic, that is in charge of maintaining nuclear warheads for submarine-launched ballistic missiles. The Leonov has been tracked since January when it left Port of Spain in Trinidad and Tobago. 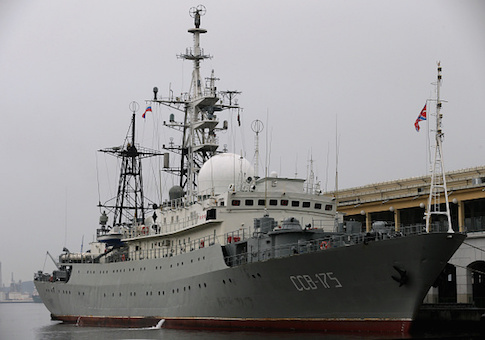 The Leonov is part of a major increase in Russian naval activity around the world. Under the Trump administration, Russia and China have been elevated to national security threats after nearly two decades of a major focus on counterterrorism operations. Last year, when the Leonov was spotted off the U.S. coast, President Donald Trump told reporters in commenting on Russian election meddling, "the greatest thing I could do is shoot that ship that's 30 miles off shore right out of the water." The Leonov was tracked by Steffan Watkins, a Canadian security analyst who closely tracks Russian ship movements. Using the data provided by military aircraft electronic tracking information, Watkins noticed that several P-8 flights had circled over water areas directly east of Kings Bay on March 6 and a second series of flight slightly south of that area on March 7. "The most obvious purpose of the ship being off the coast is collecting signals intelligence," Watkins said in an email. "The ship is outfitted with more than antennas above the water line," he said. "Viktor Leonov is reported to have magnetic anomaly sensors, acoustic gear to profile American vessels, and have the capability to map the ocean's floor." The ship is likely mapping the paths used by submarines in or out of the base and that also conduct training missions in nearby waters. "It could be looking for uncharted cables that might be connected to previously unknown sensors, or DoD communications cables that reach across the ocean," Watkins said.